Address: 1, Orimolade Avenue, Ifako, Agege, Ifako-Ijaiye, Lagos. The method has proved to be very useful for the all round development of the child in preparation for a fulfilling present and great future. 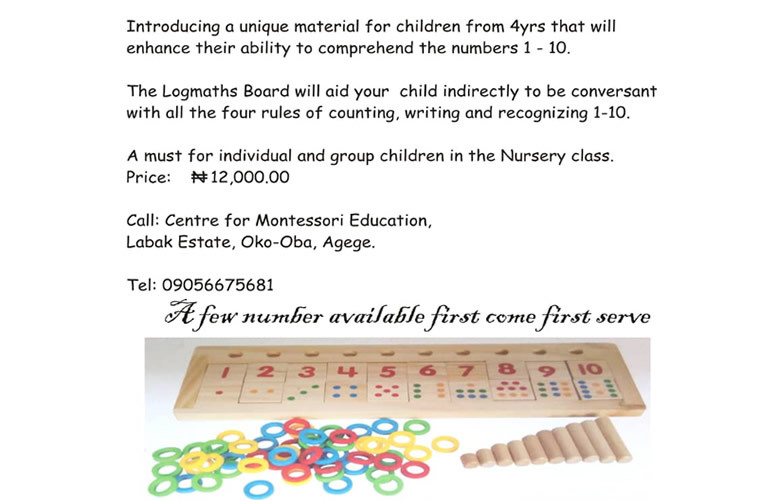 It is gratifying to note that Centre for Montessori Education (CME) has been a part of this exceptional movement for about 30 years. Many teachers and school owners have since been trained by the Centre. The Centre emphasis having the right approach at the beginning to absolutely get the attention of the learner leading to providing intellectual freedom through free choice of activity. The learning style is such that will enable the learner assimilate, acquire skills and accomodate new materials, understand style and processes without stress.......continue. Click here for the CME Yellow Pages.